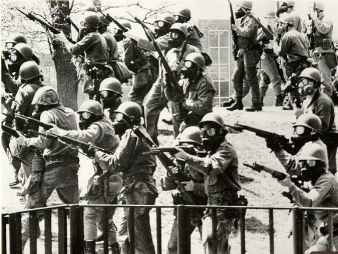 A Childhood Memory of Kent State, May 4, 1970. | Paul's Voyage of Discovery & Etc. 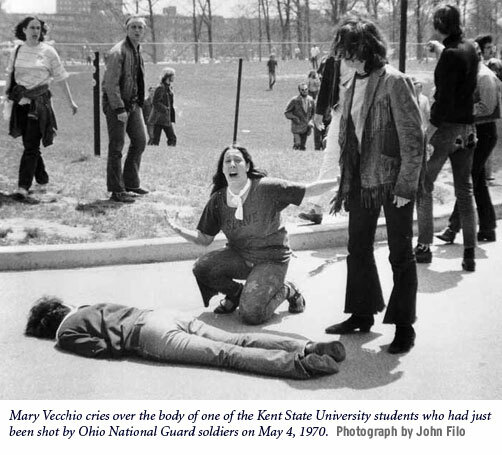 A Childhood Memory of Kent State, May 4, 1970. On May 4th, we should pause to remember the price of freedom, paid in blood by patriots – like the young people who died at Kent State. 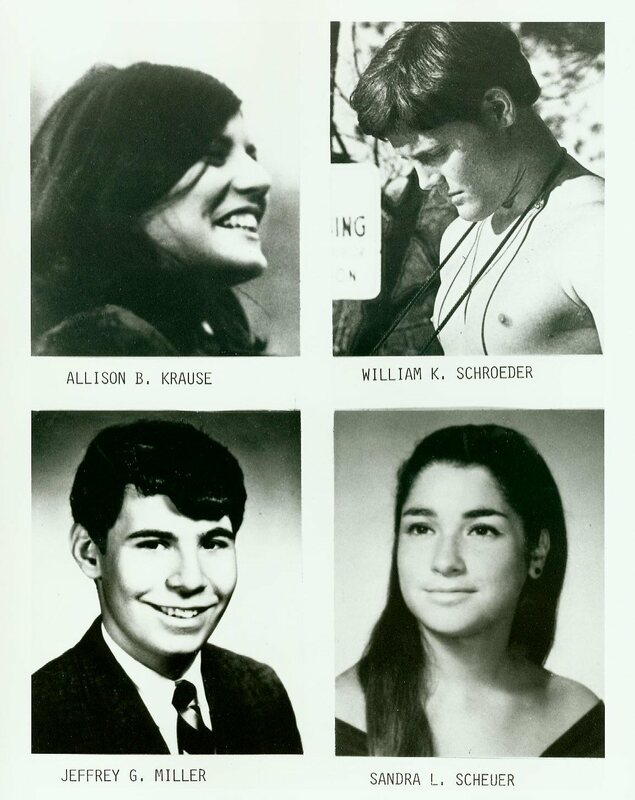 On this day 42 years ago at Kent State University, Ohio National Guardsmen fired 67 shots into a group of students protesting the American invasion of Cambodia — killing four students and wounding nine others, one of whom was permanently paralyzed. The small college town of Kent is about 40 miles southeast of Cleveland, where on Monday, May 4, 1970 I was an elementary school student at St. Rocco’s School. The shooting on the Kent State campus began at 12:24 pm – and by the time we were getting out of school at 3:00 pm, the news had reached Cleveland. But the news was by word of mouth when I first heard it. And it was wrong. That’s what I heard from one of the parents waiting to pick up their kids. When we got home and turned on our black and white television sets, Walter Cronkite set us straight. Later, Crosby, Still, Nash & Young captured the moment, the sorrow, the sacrifice — and the defiance. Thank you, Paul. I don’t think I can overstate the extent to which anger at the government, the law, and military was instilled in my tender 12-year-old heart at the thoughtless killing of students who were protesting the most unjust and wasteful war in our nation’s history. I’ve often wondered where my long and defiant resentment was kindled, and a few years ago I found my seventh grade notebook pasted with the newspaper articles of that disgraceful act. I often hear people blaming the chaos of the ’60s on youth, drugs, rock music or the “hippies,” and I just want to yell “HEY!” Four dead in Ohio. A tragedy that was turning point in ending the war. It was probably the” hey those are our kids protesting and fighting in this nonsensical war.” I graduated from high school that year and had a low draft number about a year later. I was and remain appalled by how easy it is to fervently induce the American public to lust war. Great post Paul — amazing to see those lyrics in print. Kent State was the end of the 60s, really. It’s so crushingly sad to look at the pictures of those 4 kids. I have two Kent State memories with you in ’em. The first is when we got to the 10th anniversary march at Northwestern and Chaplain Avery looked at us and said, “Ah, the lunatic fringe has arrived,” which made us ever-so proud — a Kent State memorial seemed to call out for a lunatic fringe. The second is the moment when we were at Kent State with the Rockmes, and we looked through the bullet hole in the statue on the hill straight to that spot in front of the curb in the picture that you’ve included above. Chilling. And we can’t forget that it was only 10 days after Kent State that 2 more students were killed (and 12 wounded) by guardsmen at Jackson State in Mississippi. A divided nation? I guess it’s nothing new. Ah, yes. Deering Meadow. I remember it well. Thanks for recalling that memory, B. Both memories, in fact. I must add a third Kent State memory — when I visited my girlfriend who was a nursing student at Kent State in the fall of 1977. That day, there was a demonstration on campus, protesting the plan to build a gymnasium complex on a portion of the ground on which the shootings took place. I was growing out my hair for a fall production of “Hair” at Northwestern (also featuring Mr. Hall). As I arrived on the Kent State campus and got out of my car, I heard a voice yell out, “Hippy, go home!” There was evidently some animosity on campus directed at old student lefties descending upon the campus for the protest. (Lots of current Kent State students really wanted a new gym. And who could blame them?) That day, the cops tear-gassed demonstrators on the same ground that shots rang out 7 years before. I remember the faint smell wafting across campus. Strange days, indeed. Yes thank you Paul. I remember it all so well. It had been a couple of tough years after 68. In 69 there was some joy but the Kent State shootings dashed all hope. Peaceful change was not going to happen. The Gov’t had actually opened fire and I made plans to move into the mountains. I kept a newspaper clipping of that photo on display for many years. I’ll never forget it. “Tin soldiers and Nixons coming” Pepper spraying cop last year – “this summer I hear the drumming”. Thank you for keeping this memory alive.